Mix all the ingredients in a container and then salt and pepper the fillets to taste. Place them in the marinade and store in the refrigerator for 20-30 minutes. Heat 1 tablespoon of olive oil in a skillet over medium-high heat. Save the marinade and cook the fillets for 4-5 minutes on each side (only flip them once). Set the fillets on a plate and pour the marinade into the skillet. Reduce to a glaze and pour over the mahi mahi. 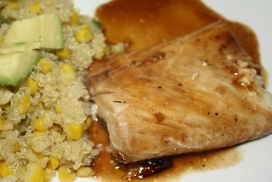 One Response to "Ginger Glazed Mahi Mahi"
I made this tonight and it was very good, even the kids ate it which is weird. It was a busy day and I got dinner started super late so the fish was still frozen while it was marinating and maybe even while it was cooking. Eric was eating his and he said it wasn’t done so I tossed it back in the pan. I think his was actually better than mine because the sauce kinda caramelized to the fish, yummy! !